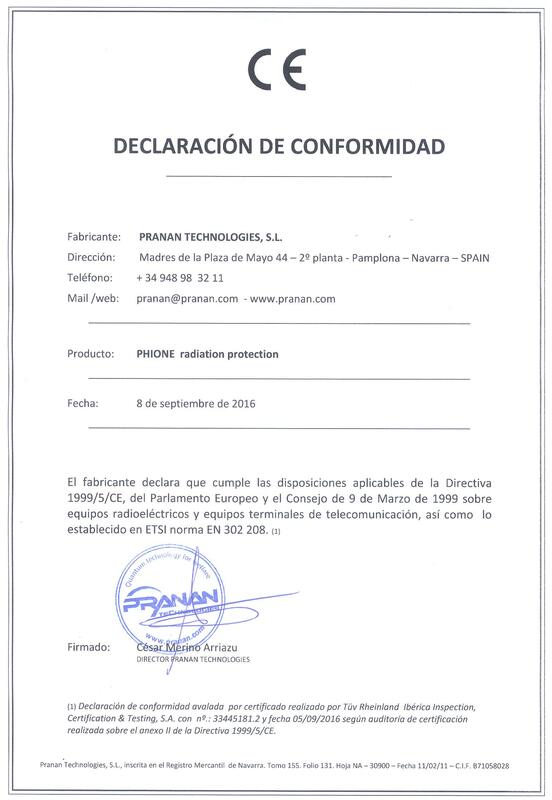 Pranan devices are certified by Tüv Rheinland in accordance with European Directive 2001/95/EC, which guarantees that they meet all necessary safety requirements to allow them to be marketed. 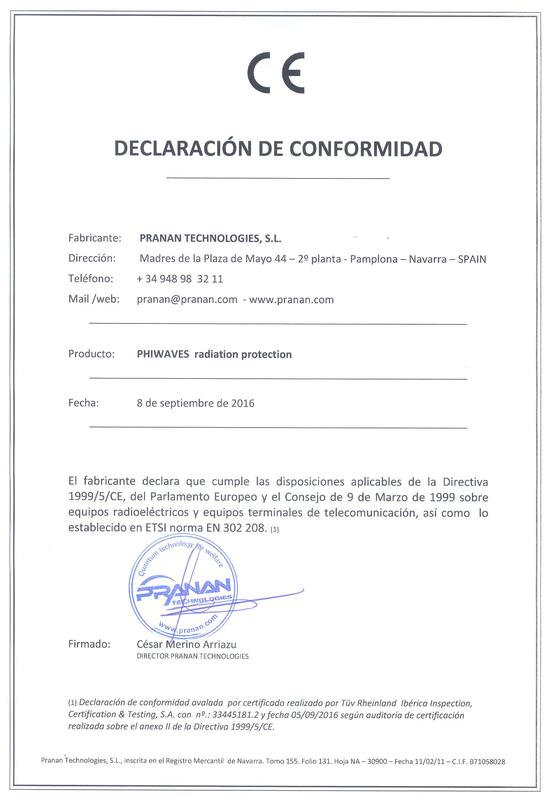 Pranan devices are certified by Tüv Rheinland in accordance with Directive 1999/5/EC, Annex II of the European Parliament and Council dated 9 March 1999 on radio equipment and telecommunications terminal equipment and therefore meet the safety requirements set out therein, making them suitable for sale. ISO 9001:2015 Quality Assurance Certificate for the design, manufacture and marketing of nanotechnological devices for protection against electromagnetic radiation and the welfare of people. OHIM - Office for Harmonization in the Internal Market. The certificate is issued for the Phione and Phiwaves models, developed and patented by Pranan Technologies. Issued by the Centre for Biomedical Research. Research Group CTS 101: Cellular Communications, on the effectiveness of Pranan devices in protection from electromagnetic radiation. Issued by the Complutense University of Madrid School of Medicine, on the effect of external inhibition (Pranan technology) on electromagnetic radiofrequency exposure emitted by mobile phones on cerebral electrical activity on EEG. 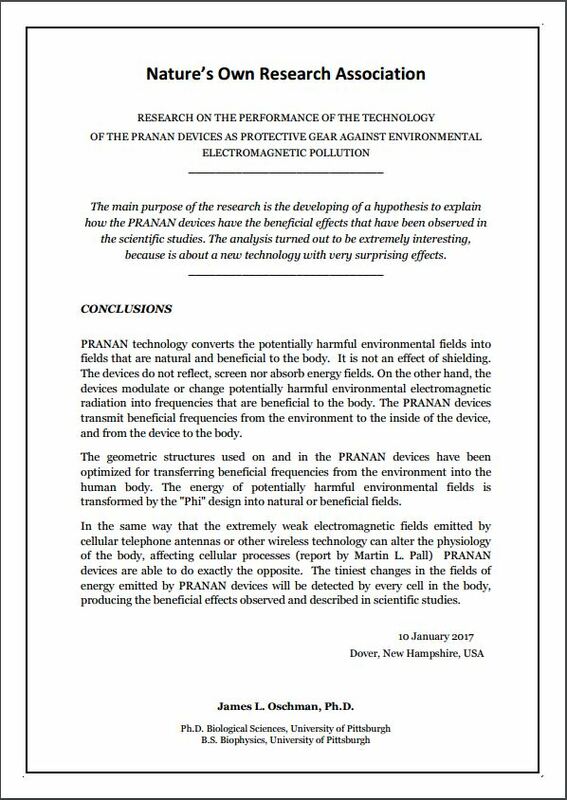 On the effectiveness of Pranan devices to neutralise the harmful effects on the body of low-intensity radiation emitted by mobile phones. Developed in collaboration with the Public University of Navarre, this anti-copy system is based on NFC technology or wireless communication protocol by induction of an electromagnetic field. Performed by the Department of Applied Physics at the Polytechnic University of Catalonia on the physical-mathematical functions of the technology used in Pranan devices. Invention Patent Certificate-Title for a protector against the harmful effects that electromagnetic radiations emitted by wireless devices can produce. Moderna Seal, which confirms the alignment of business projects with Navarre’s strategy for economic development in its three priority areas: green economy, health economics and talent economy. The MODERNA Seal allows access to funding from the European Investment Bank. 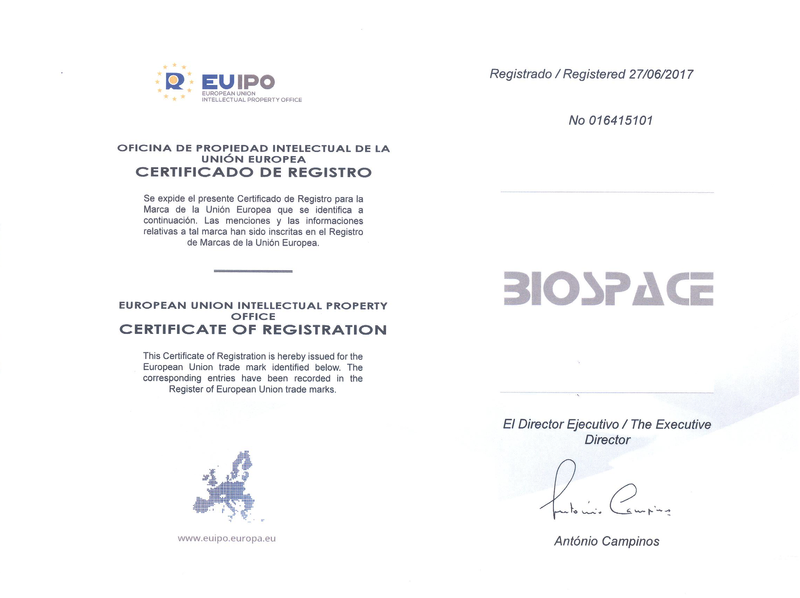 The Spanish Ministry of Economy and Competition’s Department of Innovation and Competition awarded its Innovative SME Seal to Pranan Technologies, in accordance with the provisions of EU Order ECC/1087/2015 of 5 June 2015 and published in the Official State Gazette on 11 June 2015. The manufacturer declares that this apparatus complies with the applicable provisions of Directive 1999/5/EC of the European Parliament and Council dated 9 March 1999 on radio equipment and telecommunications terminal equipment, as well as with the provisions of the ETSI standard EN 302 208. Collects the findings of the study by the scientist and biophysicist James L. Oschman, on the effectiveness of Pranan devices as effective protects against electromagnetic radiation.